A MAN is in hospital with a serious head injury after being hit with a crowbar when he confronted a gang of car thieves. The 37-year-old was attack when he confronted three men who had broken into a Ford Transit in Wincanton Way, Waterlooville, between 9pm and 9.15pm last night. A 37-year-old woman was punched in the face by one of the gang. Police say that the weapon used to hit the man was possibly a crowbar and that he is being treated at Southampton General Hospital for a serious head injury. His condition is described as serious, but stable. There are descriptions of two of the three men, both of whom were thin and white. The first wore a grey hooded top and had his face covered by a scarf. He was also wearing a baseball cap under the hooded top. The second was driving the car the men left in. He was 5ft 8in, in his late teens, and wore a grey hooded top over a baseball cap and had his face covered. 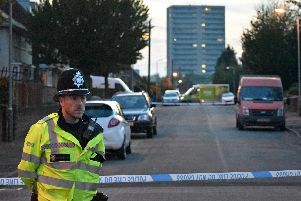 Chief Insp Alex Reading said: ‘We are carrying out detailed enquiries into this serious assault, which is a very rare incident in this area. The Neighbourhood Policing Team will be regularly patrolling and speaking to residents. ‘Anyone with concerns can speak to detectives conducting enquiries in the area or uniformed members of our Neighbourhood Policing Team.